HomeProducts FolkArt ® Milk Paint™ Bonding Primer and Sealer, 6.8 oz. Use this water-based primer to allow Milk Paint to adhere to a variety of materials, including metal, painted, and varnished surfaces. This non-toxic formula can be used as a durable acrylic sealant and dries to a flat, matte finish. Versatile as both a primer and sealer, this step is perfect for adding a layer of protection to your Milk Paint projects and cleans up easily with soap and water. FolkArt ® Milk Paint™ - Shaker Red, 6.8 oz. 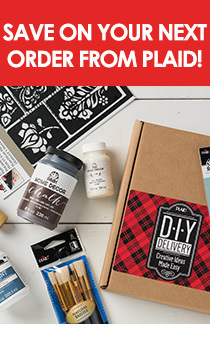 FolkArt ® Milk Paint™ - New England Red, 6.8 oz. FolkArt ® Milk Paint™ - Farmhouse Ochre, 6.8 oz. FolkArt ® Milk Paint™ - Britches, 6.8 oz. FolkArt ® Milk Paint™ - Liberty Green, 6.8 oz. FolkArt ® Milk Paint™ - Plymouth Rock, 6.8 oz. FolkArt ® Milk Paint™ - Brass Buckle, 6.8 oz. FolkArt ® Milk Paint™ - Cabinet Maker's Blue, 6.8 oz. FolkArt ® Milk Paint™ - Veranda Blue, 6.8 oz. FolkArt ® Milk Paint™ - Sumter Blue, 6.8 oz. FolkArt ® Milk Paint™ - Blue Belle, 6.8 oz. FolkArt ® Milk Paint™ - Lexington Blue, 6.8 oz. What is FolkArt Milk Paint Bonding Primer & Sealer and how is it used? FolkArt Milk Paint Bonding Primer & Sealer is formulated as a multi-purpose primer, sealer and protective topcoat. It is a water-based, non-toxic bonding primer that acts as a primer on previously painted or varnished wood and metal surfaces. It can also be used as a topcoat to seal and protect a completed FolkArt Milk Paint painted project. When applied to a surface, FolkArt Milk Paint Bonding Primer & Sealer appears milky when wet, yet dries to a clear, flat finish. FolkArt Milk Paint Bonding Primer & Sealer can easily be cleaned from applicator tools using soap and water. How should I apply FolkArt Milk Paint to a surface prepared with FolkArt Milk Paint Bonding Primer & Sealer? After allowing FolkArt Milk Paint Bonding Primer & Sealer to thoroughly dry (approximately four hours), the surface can be painted with FolkArt Milk Paint. Follow the same paint application instructions as for painting on an unfinished surface. How should I apply FolkArt Milk Paint Bonding Primer & Sealer to topcoat my completed project? Simply load the FolkArt Milk Paint brush with the FolkArt Milk Paint Bonding Primer & Sealer then apply the sealer to your completed milk painted project using long, smooth brush strokes. While wet, you will notice FolkArt Bonding Primer & Sealer is milky yet it will dry to a clear, flat finish. When is it advisable to use FolkArt Finishing Oil or FolkArt Bonding Primer & Sealer after completing a project painted with FolkArt Milk Paint? Whether you use Finishing Oil or Bonding Primer & Sealer depends on the surface you’re using. FolkArt Finishing Oil is best used on a surface that has been painted with FolkArt Milk Paint directly over raw, unfinished wood. FolkArt Finishing Oil will penetrate the layers of milk paint as well as into the unfinished wood surface. NOTE: The color of FolkArt Milk Paint painted surfaces will slightly darken and become rich in color after the finishing oil has been absorbed. If desired, test for any color changes in an inconspicuous place. FolkArt Bonding Primer & Sealer is best used on a surface has been previously finished either, painted or stained, and has been sealed with a varnish. It is recommended to use FolkArt Bonding Primer & Sealer over the surface, before painting, as well as after completing the project. NOTE: Be sure to allow ample dry time after applying the priming coat before painting and again after completing the project before applying the protective coat.